With fall almost here, it will not be long before the cool weather arrives. While you (along with most people) will probably welcome this, will your HVAC system? For the past few months, you probably had your AC running almost non-stop, so you know that system is working. But, are you sure your heat will get the job done this fall and winter? To make sure, you need to call in a pro. Aspire Heating & Cooling is a veteran owned business serving the Winston-Salem area. When it comes to HVACs, we are the experts. Of course, the first thing we will do is thoroughly check out your system. If it isn’t working as it should, we will identify the problem and make the necessary repair. Our certified technicians are available any time you have a problem. In some situations, repairs are not worth the expense. If this is the case, we can install a brand-new system for you. 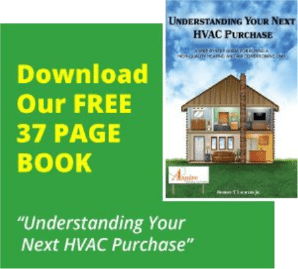 Depending upon the age of your HVAC or heat pump, it may be nearing the end of its lifespan. The best way to keep your heating system in great shape is with regular service. We can inspect and maintain your system periodically to make sure everything is working properly. Moreover, these regular check-ups are critical to prevent major problems in the future! A small repair now may prevent a large problem later on! In fact, we have several service plans available, so that you are sure your system will work properly during every season. As hot as this past summer was, the winter may be just as cold. Of course, if you want to stay nice and warm in your home, your heat has to work properly. Before the really cold months get here, contact Aspire Heating & Cooling. Right now, we will ensure that your system will hold up for the winter and beyond. Our customers are important to us, which is why we offer different financing options. In addition, because we are a veteran owned business we like to give back. We do this by offering a 10% discount to vets on any service calls. The same discount also applies to senior citizens. Today, for a free quote, just contact us.